Present-day two-grained wild einkorn and wild rye are difficult to distinguish. 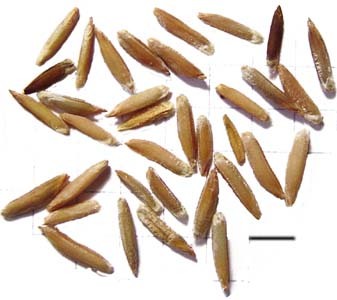 The presence of grains with a convex ventral surface indicate the presence of single-grained einkorn Triticum boeoticum. 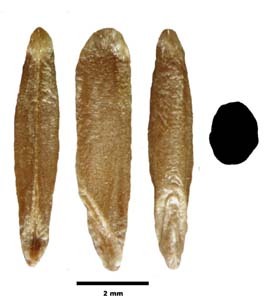 Top left and right Secale vavilovii. Karaca Dag. Note all caryopses have a flat ventral surface. Bottom left Triticum boeoticum. Karaça Dag. 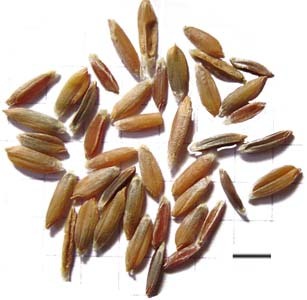 Note some grains are from single-grained spikelets which gives rise to caryopses with a convex ventral surface, clearly distingishable from Secale grains.